Bali, October 15th, 2014 â€“ Once again Archipelago International, one of Indonesiaâ€™s largest hotel operators, will hold their regional annual cooking and bar mixing competition and job fair in Bali. 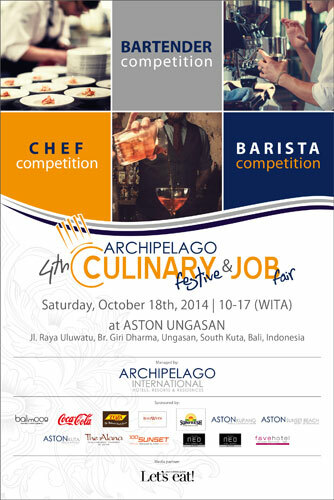 The 4th Archipelago Culinary Fest 2014 & Job Fair will be on Saturday 18th October 2014 at the recently opened Aston Ungasan Hotel & Convention Center bringing together the best chefs, bartenders and barista from Archipelagoâ€™s eclectic Bali hotel collection of 16 hotels & villas while a mass recruiting effort in form of a job fair will also be held on the same day from 10.00 AM to 12.00 PM inviting Baliâ€™s brightest to join Archipelagoâ€™s growing Indonesian hotel network of more than 100 hotels. During this yearâ€™s competition, emphasis will be set on the ever more popular style of Asian â€“ Western fusion cooking as participating chefs will be given the challenge to present a 2 course meal consistent of a seafood based appetizer and a meat dish as a main course. While ingredients and time are predetermined, competitors will be encouraged to let their creativity run free. The event also will see a Barista competition which will be following the same ordinances and rules as used for the famous World Barista Championships and a Bartender competition which will be divided into two parts focusing on creative cocktails as well as non-alcoholic mock-tails. New to this yearâ€™s event will be the a fun filled Sambal competition (Chili competition), in which members of the audience will be asked to select Baliâ€™s the best tasting Sambal and a Canape & Light Food exhibition and food tasting. â€œWe are very fortunate to be able to hold this event again, which is now already in its fourth year. It is meant to showcase the talent of our local chefs and boost their motivation while at the same time intends to raise the profile of Baliâ€™s Food & Beverage Industry in generalâ€ said Winston Hanes, Archipelagoâ€™s Bali based Regional General Manager. â€œBali is well known for its many high profile fine dining freestanding restaurants but we as a hotel group want to demonstrate that not only luxury establishments but also mid-market and economy hotels can and should focus more on the quality of their restaurant offerings and the training and encouragement of our local, Balinese, talentâ€ he added. Archipelago International is one of Indonesiaâ€™s leading hotel operators with an underlying portfolio of more than 80 hotels and 12,000 rooms. As a continually expanding brand, Archipelago International has a development pipeline exceeding 95 properties in Indonesia, the Philippines and Malaysia.